The Bell in St Albans doesn't have any real ale available. Draft beer includes John Smiths, Guinness and a decent selection of lager including premium ones such as Hoegarden. Bar staff were pleasant and service was prompt, although this review was carried out in the early evening. The Bell also had a good selection of wine at a reasonable price. There is a good choice of seats; the comfy seats next to the front window are particularly inviting. This is a smart, modern, spacious pub with some nice comfortable seating areas. When this place is quiet it is a pleasant place for a drink and when it is busy in the evenings it has a good lively atmosphere. Early on in the evening it is fairly quiet but it does start to fill up after 9pm and is popular with the younger people, especially at weekends. 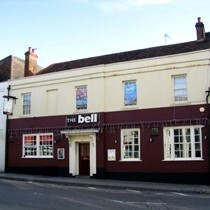 Planning permission has been agreed for the rear of the Bell to be turned into three retail outlets and the front part to be kept as a pub/bar. Opens as a Jamie's Italian.